Whether you are weeding your garden or you’re just trying to aerate the soil, a hand cultivator is going to be your best friend. You could opt for a claw-like cultivator, sometimes they are more trouble than they are worth. For optimal tilling, a product like the Fiskars Telescoping Rotary Cultivator may be what you are looking for. 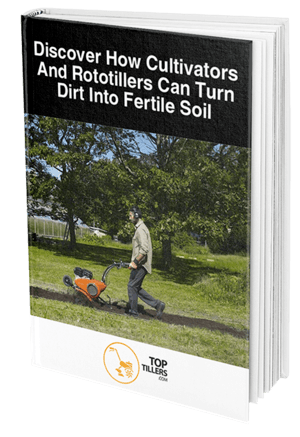 In this review, we are going to talk a little more about the features of the Fiskars Telescoping Rotary Cultivator, but we are also going to give you an overview of what people who have purchased the rotary cultivator had to say about their overall experience with it. Then, we’re going to give you our recommendation on whether or not this device is something you should consider purchasing for your own gardening needs! 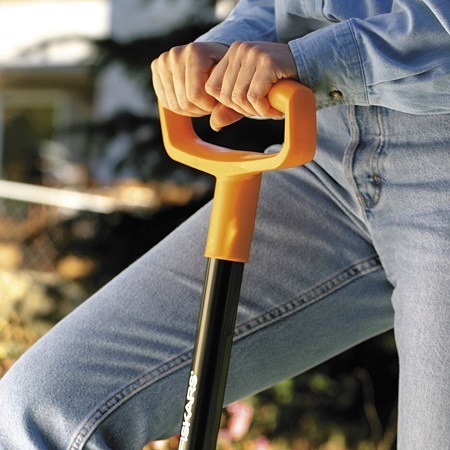 The Fiskars Telescoping Rotary Cultivator is a device that will allow you to loosen the soil in your garden so that you can remove weeds and aerate the soil to promote healthier plants. The adjustable shaft is made from 19-gauge steel, making it must stronger than a wooden shaft, but it isn’t going to bend like a fiberglass handle. You will be able to adjust the handle anywhere from 40 inches in length up to an impressive 60 inches. This range makes the tool suitable for any gardener. The unit features six rust-proof aluminum wheels that will have the strength to cut through any type of soil. The central wheels can be removed so that you can cultivate around seedling rows quickly and easily. It’s worth noting that not only are the aluminum wheels rust-proof, the handle is also rust-proof, as it features a powder-coating, which makes it easy to clean as well. When looking at what people had to say about the Fiskars Telescoping Rotary Cultivator, the majority of consumers had good things to say about the tool. Customers were impressed with the metal blades, stating that they were well designed. They the wheels rotates in unison when you go through your soil. They like that the blades are strong and they feel quite durable. 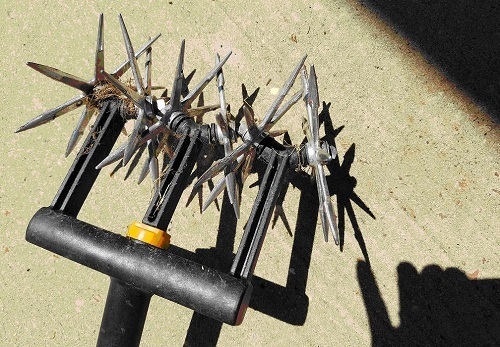 A few people commented that they purchased this tool to break up soil so that they could reseed the bald spots in their yard and it worked quite well for their needs. Other customers reported that they were impressed by how easily the blades roll to chop up the soil. 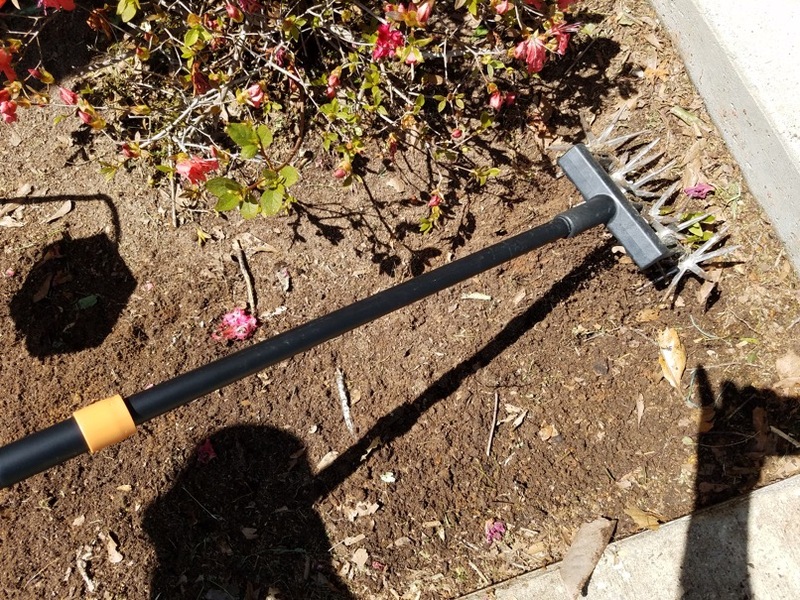 They remarked that this was much easier to use than a rake, but they do point out that for best results, you will want to use it on moist soil, which is going to be softer to work with. Customers also like that the steel and the aluminum components of this tool will not rust, thus ensuring the tool will last for a long time. While most of the reviews for this product were very positive, there were customers who were not as impressed with the tool as others. These customers were disappointed that this cultivator doesn’t dig deep into the soil – it only scrapes the surface. Because it doesn’t go deep into the soil, customers found that it isn’t very effective at loosening the soil for pulling weeds. They did, however, point out that this would be a decent option for smaller flower beds. Other customers who commented with their concerns with this tool touched on how disappointed they were by the blades. A few people said that prongs broke off very easily, even in soft soil. Another customer reported that the blades broke because their soil was a little too rocky. They were most disappointed because the blades did not appear to be removable. So, if the blades break, your tool is going to be less effective. A few customers also commented that the lock for the extension doesn’t keep the handle extended, which was quite frustrating. Gardening and maintaining the look of your landscaping can be tedious if you do not have the proper tools. The Fiskars Telescoping Rotary Cultivator is a great option for those who want to reseed bald spots in their lawn or if they have a small flower bed that needs to be weeded. This tool features a telescopic 19-gauge, rust-proof steel handle that will allow you to adjust the length of the tool. It can extend to 60 inches, but it can also retract to 40 inches. Because of this, the tool can be adjusted to the perfect length for you to comfortably work in your garden without experiencing backaches or knee pain due to kneeling. The tool also features six aluminum blades that will be able to cut through the surface of any kind of soil, loosening it so that you can pull weeds with minimal effort, or simply reseed the empty spots in your lawn. We like this unit particularly because you can remove the central wheels and till the soil around rows of seedlings quickly and easily. If you’re looking for an affordable cultivator that will make maintaining your small gardens easy and help to keep your lawn looking nice and full, then we feel this is a great tool to have at the ready come spring time!